OpenBSD/landisk runs on machines related to the IO-DATA USL-5P, using a Hitachi/Renesas SH-4 CPU. Note: The "Giga-landisk" and HDL-F machines are ARM-based (both Intel XScale & Marvell), some of which were supported by the defunct armish architecture. OpenBSD/landisk is the 1st OpenBSD port to a Hitachi/Renesas SH-4 based machine. It is hoped that other SH-4 based machines will show up which are interesting enough for our user and development community, but the SH-4 processor is normally used only in true embedded products. This processor architecture is the first 32-bit successor of a series of extremely bizarre 8 and 16 bit processors by Hitachi. It has a very strange instruction set and MMU, and developers find it quite a challenge to map their knowledge of Unix low-level ideas to the processor architecture. Hardware support is mostly complete and quite stable. For a complete system component and device driver listing for this architecture, see intro(4/landisk). HITACHI SH4 SH7751R processor at 266MHz. wdc(4) drive controller connected to either flash or microdrive in a CF socket, on some models. pciide(4) IDE drive controller supporting wd(4), on some models. com(4) serial port console at 9600 baud (lacking hardware flow control). ehci(4) and ohci(4) USB controllers supporting most usb(4) devices. power(4) button and some LEDs. The latest supported OpenBSD/landisk release is OpenBSD 6.5. Here are the OpenBSD/landisk installation instructions. Snapshots are made available from time to time, in this location as well as on a few mirrors. Here are the OpenBSD/landisk snapshot installation instructions as well. All of these machines require a special serial cable which does voltage conversion, and can hopefully be purchased along with the card. This cable normally contains a little max232 or similar chip which converts from the 3.3V signals to +/-12V. The IO-DATA cable has pins which can grip the inside of the holes. Or you can attempt to build your own using some Japanese instructions. The IO-DATA cable converts from a DB9 connector to a 5-pin header (3.3V Tx Rx GND NC). Note that the Rx and Tx pins on the board are swapped compared to the ARM-based machines made by IO-DATA. All the board models have a 5-pin connector (called CN7) which the cable can plug into -- except for the USL-5P which has a 4-pin header (thus requiring removal of the spare pin). 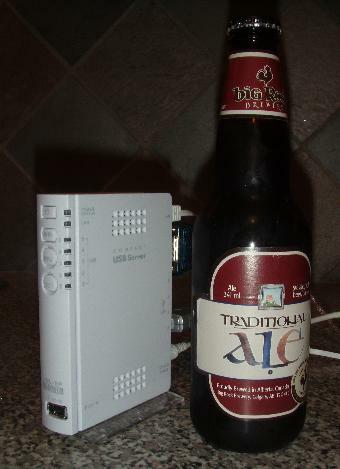 A USL-5P is shown with a modified IO-DATA cable. In this case the cable has been shortened significantly and the DB9 connector is glued into a slot carefully cut into the plastic between the ethernet and a USB port.